I am new to TRT, so don't know much and still learning.I just said whatever the pharmacist told me.Actually I could not find any info about this expiration myth. I think I just believed whatever the pharmacist told me. They are certainly more knowledgeable than what I know.I did not say this to offend anyone earlier.I just wanted to express what I know even though my knowledge is limited about it. Testosterone can be good for up to 2 years amigo. You’re just wrong on this no offense. I’ve been on for years and always have a 10ml vial that lasts me 3 months. Blood work regularly confirms. Pharmacists are idiots. I asked a pharmacist the other day what’s the difference between the extra strength breath right strips were and she said “it’s a higher dosage” - it’s a nose strip. Don’t listen to your pharmacist. Test will be good for up to 2 years. You’re in the right completely. However, the issue about number of vials versus scripts from doctors has to do more with controlled substances and states laws in the US. In Massachusetts pharmacies don’t even carry the 10ml/200mg vial of cypionate. Most pharmacies will dispense only what’s needed regardless of what the script says. One pharmacist with a lot of experience agreed to give me a three month supply (12 vials) but when my doctor’s office called to send the script the pharmacist in turn, a new in the business, said “NO” and the office didn’t bother as it is rather unusual that a Massachusetts Pharmacy will give more than a one month supply. Frustrating and totally based on fear to get in “trouble” on the Pharmacy’s end. In Orlando, Florida, however, Costco Pharmacy will give you a 10ml via of cypionate (200mg) without any problem at all. Costco Pharmacy in California will fill up a prescription for three months but will not give you a 10ml/200mg vial under any circumstances claiming the 28 expiry window as the reason....I travel a lot so I found myself with no cypionate at one point. I lost scripts because controled substances can only be transferred once even within the same Pharmacy under Massachusetts law. Indeed one 10ml vial would make my life easier as it can last more than thre months since it doesn’t go bad at all. My Dr is all for it but he said that if I found a way to get that one 10ml vial I should let him know. I do: Orlando Florida! 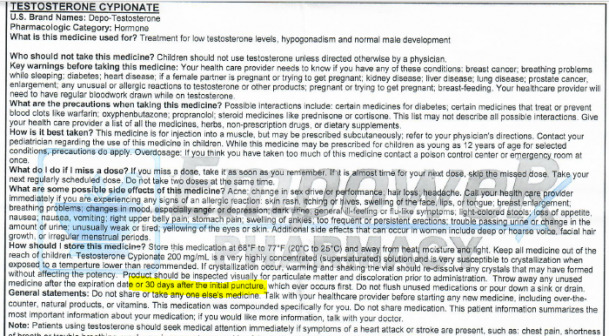 FWIW: I just received my first order of T-Cyp from Empower (5ml vials), and the accompanying paperwork clearly states to discard 30 days after first puncture. If I were to follow this, I would be throwing away 1/2 the vial based on my current dosing schedule. same thing my pharmacist told me. pharmacist said good only for 28 days once punctured/used.but I still don't know if it is true or false.I will ask doc on next visit.may be the efficacy goes down once air goes inside or may be the preservative deteriorate after air goes inside. . It lasts longer than 28 days. My urologist is all for getting a multiple ml vial if one is able to get one. He’s all for the 10ml/200mg cypionate vial. It saves time and money and it’s ideal when you travel. Your Dr must know that you aren’t going to use the whole thing in 28 days otherwise he would have prescribed you single ml vials. You can also check when your next refill is going to be available (if you have refills). If I may ask, how much did you pay for it? I thought we had put this matter to bed. how do you get 10ml/200mg vial? I would like to know how much to take monthly and 10ml vial you get for how many months supply? I don’t get a 10ml/200mg vial even though my urologist has written a prescription. They will give me what I need in 1 ml vials regardeless of what the script says. Pharmacists aren’t very smart to understand that the refill will happen only after three months or more. I take 140mg of cypionate per week. My point was that my doctor believes that a 10ml vial is more convienient in many ways: to draw, when you travel, fewer trips to the Pharmacy, etc. He knows I will not use the whole vial in a month hence the vial will last a few months and not go bad. If you live in the US in a state or city which honors the 10ml vial of cypionate script, you’re fine. My guess based on your question is that you can’t either. The max a dr can prescribe is 200mg per week for TRT. Testosterone doesn’t go bad for years! I know. I just wished pharmacies would follow my Dr’s script and give me one and make my life easier. That would save me money too. I don’t get a 10ml/200mg vial even though my urologist has written a prescription. I take 140mg of cypionate per week. My point was that my doctor believes that a 10ml vial is more convienient in many ways: to draw, when you travel, fewer trips to the Pharmacy, etc. The max a dr can prescribe is 200mg per week for TRT. yes my doctor also prescribed me 10ml vial and 100mg/week. Pharmacy denied to give me 10ml vial, instead I got two 1ml vial for one month supply.